ALABAMA is an american southern rock band from Fort Payne, Alabama. The group was formed in 1969 with members Randy Owen, Teddy Gentry and Jeff Cook (who are all cousins, by the way) under the name Wildcountry, but didn’t change their name to ALABAMA until 1977! They took off in the 1980’s after signing to RCA Records. Over the decade, the band racked up over 27 number one hit songs including “Mountain Music” (1982), “Dixieland Delight” (1983) and “If You’re Gonna Play In Texas (You Gotta Have a Fiddle in the Band)” (1984) and have over 40 hit songs to date. 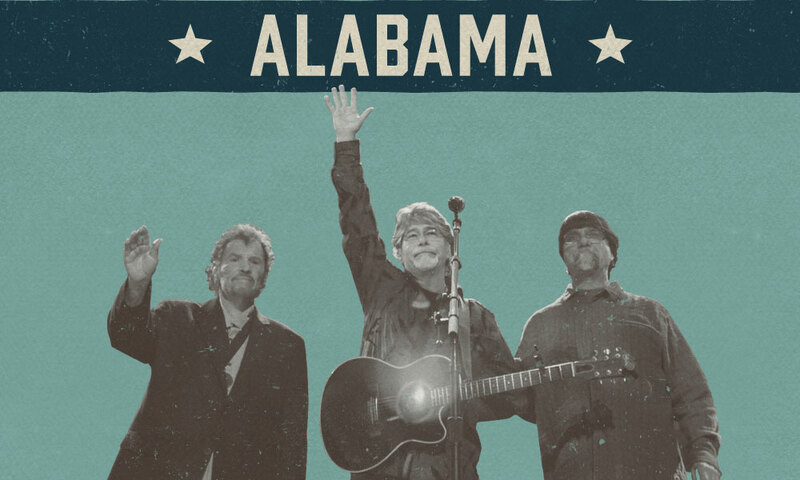 Because of their combination of southern rock, traditional country, and pop, ALABAMA have had worldwide success across all listeners, and have been credited with being “one of the most popular acts in American music history and substantially broadening country [music’s] audience”. They have sold over 75 Million records worldwide, making them one of the most successful bands in country music history. The band announced their disbandment in 2004 along with a farewell tour, but after only a six-year hiatus, the band returned in 2010. They continue to tour and record, plus will be hitting our stomping grounds at Burl’s Creek this July to be the first ever headliner of Big Sky Music Festival!